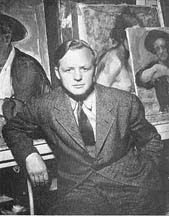 On February 14, 2010, the exhibit “Millard Sheets: The Early Years (1926 – 1944) opened at the Pasadena Museum of California Art. Curator Gordon McClelland has organized the first cohesive survey of the first two decades of this early California painter’s career. Millard Sheets was born in Pomona, California, in 1907. He attended the Chouinard Art School in Los Angeles, studying with Clarence Hinkle. 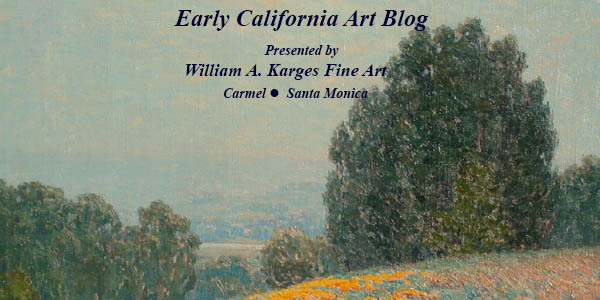 Following a painting trip through Europe, Sheets returned to Los Angeles to teach at Chouinard. He is best remembered for his depression-era regionalist works known as the “California Scene Paintings.” Sheets spent 20 years teaching at Scripps College, and 6 years as the director of the Otis Institute before retiring to Mendocino County in 1960. “The Capitol Building” was a part of a larges series Millard Sheets completed in the 1950’s and early 60’s as a commission to promote areas serviced by United Airlines. The images were reproduced in a series of United Airline calendars to promote the wonder of travel. The Pasadena Museum of California Art is dedicated to the exhibition of California art, architecture, and design from 1850 to the present. 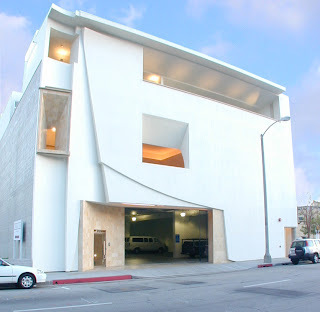 Located at 490 East Union Street, the museum opened to the Public in June, 2002. Open Wednesday through Sunday from 12 to 5 pm, this exhibition features a cross section of eighty outstanding oils, watercolors, drawings and lithographs, a number of which have not been publicly displayed since the 1930s. The Exhibition continues through May 30th, 2010. This is pretty, I love it. I can't wait to see more.